Inspired by the award-winning book series by Stuart J. Murphy, The Main Street Kids’ Club: A MathStart Musical tells a tale of adventure, mystery, friendship and math. The author came to the show! Read about it here! KIDS! Here's a coloring page to color and bring to the theatre! Meet the cast after the show then head next door to A.C. Petersen's for ice cream! 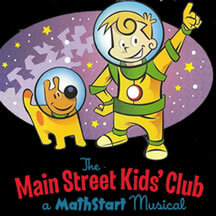 The Main Street Kids Club (aka M.S.K.C) is a cool kids’ club that follows the motto, “Math skills = Life skills!” they use numbers to figure out the various things life throws their way. Toby, the “new kid in town,” desperately wants to join. When he finds a 50-year-old treasure map, he sees a chance to prove himself. With six interwoven stories, each focusing on a different mathematical concept, this musical promises to be educational and entertaining for all ages! NICOLE FAZIO (Maggie) Playhouse on Park: debut! Spirit of Broadway Theatre; Witch Trio (BENEDICT ARNOLD THE MUSICAL). Shakesperience Productions: Hero (MUCH ADO ABOUT NOTHING). New York Theatre: Keepers (FringeNYC). NYU: Lily (THE GIVER). Many thanks to friends and family! FRANCESCA FIORE (Sherri) is thrilled to be back at Playhouse on Park! Past theatre credits at PoP include Gwin (THE CLOWNS), Ensemble (GOODNIGHT, MOON). When she is not onstage performing she is teaching art at the Talcott Mountain Academy in Avon, and hopes to see her students' smiling faces in the audience. Because math skills are life skills! PATRICIA MCCARTHY (Dani) Playhouse on Park: Magenta (ROCKY HORROR PICTURE SHOW), Cheryl (MISS NELSON IS MISSING), New Haven Theatre Company: Geraldine/Dog (EVERYTHING YOU OWN...). Patricia is also a writer and actor in the new BroadwayWorld.com exclusive web-series So You Wanna Be a Broadway Star? SARAH MILLER (Maddy) Playhouse on Park: debut. CCSU: Monica Reed (PRESENT LAUGHTER), Juror #10 (12 ANGRY MEN), Agnes (A DREAM PLAY), Wife (THE PROBLEM), Lallie Rowen (THE KENTUCKY CYCLE). New Britain Repertory Thetre: Belle (A CHRISTMAS CAROL). Sarah holds a BFA in Theatre from Central CT State University. VICTORIA MOONEY (Tobi) Playhouse on Park: Mouse (GOODNIGHT, MOON), Green Dog (GO, DOG. GO! ), Mama D's Outrageous Romp. Downtown Cabaret's: Vixen (RUDOLPH & THE REINDEER GAMES). Hartford Children's Theatre: Tracy (HAIRSPRAY), Title Role (PINKALICIOUS), Shulie (SCHOOLHOUSE ROCK). Warner Theatre: Humpty (SHREK, THE MUSICAL). Victoria currently teaches at Hartford Stage Education and is also a regular perfomer at PoP's Mainstage Mondays. Originally from Hilton Head, SC she performed in over 25 productions through school, regional and community theaters. Other favorites include: Annie (ANNIE GET YOUR GUN), Portia (CINDERELLA), and Gertrude (SEUSSICAL). MEAGHAN SULLIVAN (Meg) Playhouse on Park: debut! Arizona Repertory Theater: Little Red Ridinghood (INTO THE WOODS), Schwartzy (THE 25TH ANNUAL PUTNAM COUNTY SPELLING BEE, Musica Hall Singer (VIOLET). West Hartford Community Theater: CABARET, NO,NO NANETTE. Last spring, Meaghan directed and choreographed HOW TO EAT LIKE A CHILD at King Phillip Middle School and also teaches for Performing Arts Programs in South Windsor. She recently received her BFA in Musical Theatre from the University of Arizona. KEVIN BARLOWSKI (Director and Music Director) has had the distinct pleasure of directing (MISS NELSON IS MISSING, BUNNICULA), music directing (ALL I REALLY NEED...KINDERGARTEN) and acting at Playhouse on Park, where he has performed as Bobby (CABARET), MC (THE CLOWNS), Emcee (MAMA D's OUTRAGEOUS ROMP), Peter (COMPANY), Linus (YOU'RE A GOOD MAN, CHARLIE BROWN), Professor (I THINK I CAN), THAT HOLIDAY FEELING CABARET and Boy (IF YOU GIVE A MOUSE A COOKIE). Education: B.A. Theatre Education from Emerson College and Circle in the Square Theatre School. Kevin is a Theatre Arts instructor at Hall High School and the Greater Hartford Academy of the Arts. He also works as an accompanist, music director and vocal coach in CT, MA and NY. Kevin is expressly grateful to Darlene, Sean and the entire PoP staff for the unfaltering guidance, support and faith in affording him these opportunities. Love to Mono.